Studies show that approximately 1 in 5 Americans suffers from a hearing loss. Hearing naturally diminishes with age, and hearing loss related to aging (presbycusis) is the most common type, but excessive noise exposure also damages hearing and is a leading cause of hearing loss in younger adults and children. Fortunately, this type of hearing loss is avoidable. One of the most important steps you can take is to wear adequate hearing protection whenever necessary. Earplugs are available in a wide variety of shapes, sizes and styles, and are designed not just to prevent excessive noise from damaging the ears, but also to keep foreign objects like water, dust and dirt from entering the ear canals. Because everybody’s ears are unique, it’s a good idea to invest in a pair of earplugs that have been custom molded to fit your ears, especially if you are exposed to a noisy environment on a regular basis. Earplugs designed for noise protection may be made out of memory foam that is compressed until inserted in the ear, where it expands to fill the canal; silicone, which is rolled in the shape of a ball and molded to fit over the external portion of the ear canal; and flanged, which resemble miniature Christmas trees and are inserted into the ear to create a firm seal. All earplugs are rated by decibel level, and are either disposable or permanent. Swimmer’s earplugs are a great choice for those who come into frequent contact with water. Swimmers and surfers are at risk for developing exostosis, a condition that can lead to bone growth in the ear canals and, eventually, hearing loss. These specially designed earplugs, typically constructed of wax or foam, protect the ears by preventing water from entering. Musicians require earplugs that will reduce volume without causing sound distortion, which would lead to muffled speech and music. 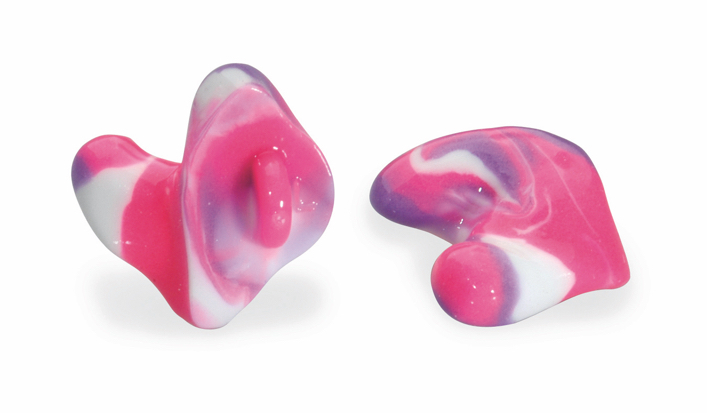 Hi-fidelity musicians’ earplugs are custom fitted and allow in the full range of sound. Options like interchangeable attenuators for various decibel levels are available. Of particular use to hunters and those in law enforcement is electronic earplugs. These contain an acoustic filter that softens loud noises while amplifying quiet sounds. They are designed with a valve that shuts when it is struck by sound waves such as gunshots.